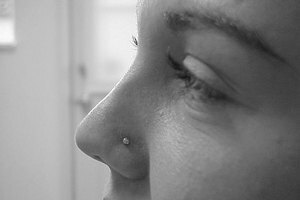 When a tongue piercing is performed, the piercer will typically use an inch-long stainless steel barbell, which must remain in place for six weeks to allow the piercing to heal. 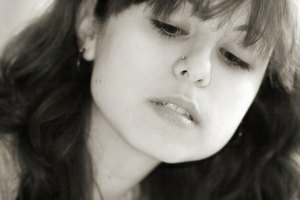 After healing is complete, it's best to change the tongue ring as soon as possible because the longer length of the barbell (required to accommodate swelling that occurs as a result of the new piercing) increases one's chances of accidentally biting the tongue ring. This can result in chipped teeth and pain. It's also good to change the tongue ring regularly to allow for cleaning, as bacteria buildup can result in bad breath and infections. These directions explain how to change a tongue ring. Wash your hands with antibacterial soap, rinse thoroughly and dry them using a clean towel. "Swish" a capful of Listerine inside your mouth for about two minutes, then spit it out. This will kill bacteria that could lead to infection. Pour a small amount of hydrogen peroxide into a cup and place the new tongue ring in the hydrogen peroxide to soak for a few minutes. This will kill any bacteria, also reducing the risk of infection. Stick your tongue out as far as possible and simultaneously grasp the top and bottom beads of the barbell. To remove the tongue ring, twist the top bead counter-clockwise while twisting the bottom bead clockwise. Pull the tongue ring out of your tongue and place the pieces inside the cup of hydrogen peroxide to soak. Retrieve the new tongue ring from the hydrogen peroxide and place on a paper towel to dry. Once dry, unscrew one of the balls from the end of the tongue ring. Stick out your tongue while looking in the mirror. Identify the site of the piercing hole and insert the tongue ring through the top of the tongue. Secure the tongue ring by screwing on the ball to the stainless-steel post. The bottom ball must be twisted counter-clockwise when securing it. Remove the old tongue ring from the hydrogen peroxide, dry it with a paper towel and store the spare tongue ring in a safe place. Swish another capful of Listerine around your mouth for about two minutes, and spit it out. This will kill any bacteria that could potentially cause an infection at the site of the tongue piercing. Gargle with an antiseptic like Listerine on a daily basis to prevent the accumulation of bacteria on the tongue ring. 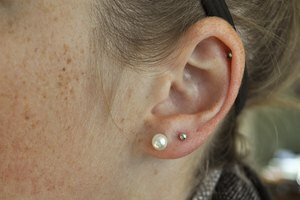 If the long barbell used for the piercing is causing problems before the end of the six-week healing period, revisit the piercer to have the tongue ring changed. How Long Do Bellybutton Rings Take to Close Up?